Direction you'd like the offset to happen (Upwards or Downwards). How you'd like the offset to be applied (take all the keyframes in the layer as one stack and offset each stack, or, take each property and offset it individually). Shuffle the layers (that have selected keyframes) before applying the offset. 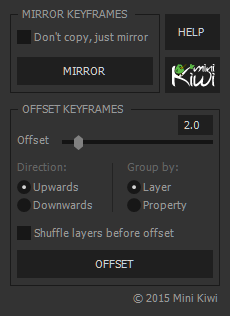 Select the keyframes and click the MIRROR button. 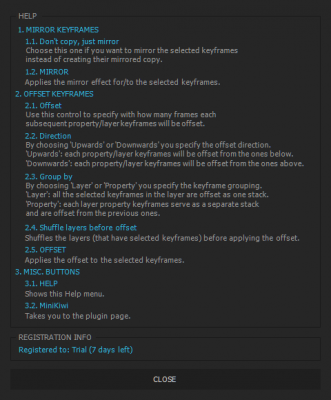 There is an additional option that lets you just mirror the selected keyframes instead of creating their mirrored copy. Note that the plugin mirrors not only the keyframes but also the easing graph.